It can be kind of tricky to stay fashionable, esp with these cold temps lately. It was 10 degrees today where I live! I live near the windy city and I am not going to lie, there have been many days where I have been in my comfy thick leggings, thermals, and uggs boots. When I’m not I’m usually wearing a very thick coat like I am here. Winter clothing is big, thick and bulky, so the trick to staying chic in cold weather is to have a few pieces that are more structured. When having a very slouchy coat and boyfriend jeans, your look is very soft and comfy. There’s nothing wrong with that, but a good statement necklace & structured purse will ALWAYS make the outfit chic & the look is more put together. I’m so obsessed with the built in long knit sleeves (with thumbholes!) on this coat! The juxtaposition of the soft sleeves & structured bag is perfection. That bag is beautiful! I have actually never seen that style before, I love it! Your jacket is great too, lovely look. You do chic like no other! This is a great look that I see myself wearing…really adore the jeans with the coat! Casual chic at it’s best. I love your coat and the beautiful LV bag! So beautiful! Love this wintery white look! Love the jeans and the all white! Chic as always! Great look! Nice jacket, I love the fact that it’s white, white looks so nice in winter in my opinion! And i’m quite jealous of your bag, it’s so pretty!! I love your all white outfit!!! You’re work spells Class to me! Gosh can I come raid your closet one day please? You look gorgeous, and that bag is amazing! this is so great 🙂 i hope you’re doing well!! You look fabulous! And that bag… it’s gorgeous! You always look so effortless chic, love it! Love the jacket!!! You look so chic! 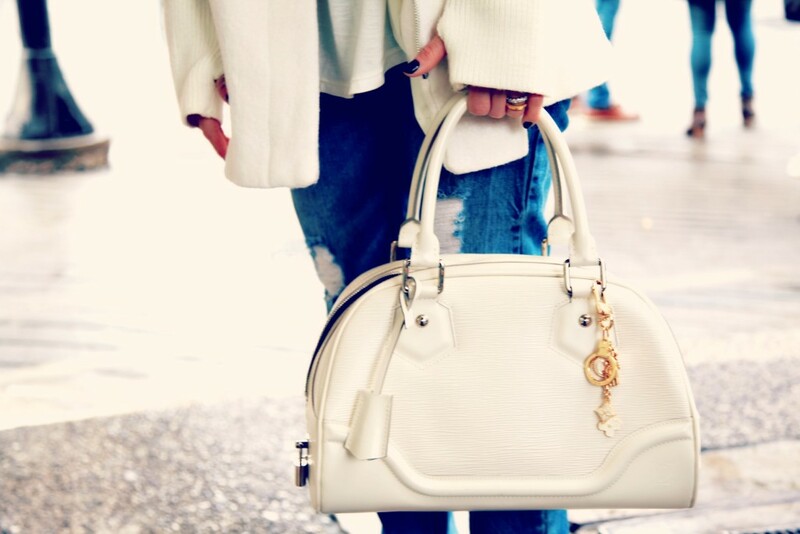 Love the white coat and bag! You look gorgeous! Great outfit! I’m loving your coat! Love it! How do you keep white things from getting dirty? Haha. looks really good 🙂 Are yu from NY? no, i’m not! 😉 thanks! xo!